Fans of Nissan’s thrilling 370Z can sleep easy in the knowledge that they can now take advantage of great value finance rates to take the strain out of affording one of the most exciting performance cars of 2010. What’s more, any existing Z driver looking to upgrade to the latest 370Z Roadster will now benefit from Nissan’s advanced Connect Premium audio and navigation system absolutely free. Recognising the long term appeal of both the Coupe and Roadster models, all 370Z models have the same predicted residual values. While drop-tops traditionally depreciate harder than their coupe equivalents, the strength in depth of Nissan’s Roadster means its residuals are just as strong as the Coupe’s. That means a 71% RV figure after 12 months/10,000 miles and a 46% RV after 36 months/30,000 miles. It’s these impressive depreciation figures that are the key to the low cost finance now available. With a price to match its badge, the mighty Z is offered in both Coupe and Roadster forms for only £370 per month using Preferences, Nissan’s personal contract purchase plan. That means all the thrills of a high performance car can be enjoyed by drivers who previously thought the 370Z pace was out of reach. A highly competitive rate of 5.9 per cent APR is the key to the tempting monthly cost. Buyers can choose between a 24 or 36 month plan with only a 20 per cent deposit. What’s more, go for the two year deal and Nissan will make a £500 contribution towards your deposit! At the end of the term, drivers have the option to change their Z for another brand new Nissan, pay an optional final payment and keep the car, or give it back. What could be simpler? All 370Z models have the same awe-inspiring V6 at their heart. With the 3.7-litre engine providing a generous 328PS and 363Nm of torque to the rear wheels, thrilling performance comes as standard. Add superb handling balance to the mix and drivers will struggle to find any more exciting use for their £370. 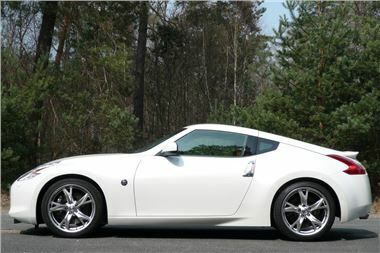 No-one will know the real thrill of the Z better than existing drivers of 350Z or 370Z Coupe. That’s why owners of those cars who upgrade to the new 370Z Roadster GT Pack will get a special loyalty bonus – Nissan Connect Premium. The advanced system brings together the latest audio technology with the latest satellite navigation into one touch screen console. Ordinarily costing £1,550 as an optional extra on the 370Z Roadster GT Pack with sat nav, the loyalty bonus adds a significant free of charge boost to the spec of new Roadster’s spec sheet.